Greece’s most famous black metal band, Rotting Christ’s career dates right back to the late 80s, when they were essentially a grind band. They quickly turned to the dark side however, and in doing so put Greece well and truly on the black metal map. Though they experimented with more gothic territories in the late 90s, they eventually returned to a more extreme metal approach and continue to create strong albums incorporating ethnic sounds, emotive riffs and rich atmospherics. 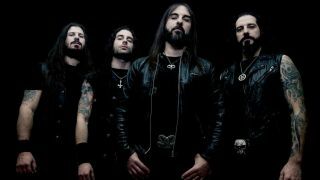 Formed in 1990, Necromantia’s early history had much in common with Rotting Christ, main man The Magus playing in both bands, while also working as a producer and recording in the studio owned by the band. Though Necromantia is not really an active band at the moment, their back catalogue houses several classics that bring a uniquely archaic and heavily occult overtone to the genre, while also drawing from old school heavy metal. They also stand out from the crowd, thanks to the band’s decision to utilise two bass guitars (one an eight-stringer) in lieu of a regular guitar. Another early black metal band, Varathron’s sound is recognisably Greek thanks to the obvious heavy metal influences, strong melodies, mid-paced and epic songs, warm production, use of synths and dark and doomy riffing. Though they were absent from the scene for some years, they are now going strong again, the band continuing to issue recordings and perform memorable live rituals. Septicflesh (previously Septic Flesh) are another group of 90s veterans, but this time not one whose background is in the black metal scene. Though sharing a taste for atmospherics and prominent use of synths, they have always leant more toward death metal influences, giving them a rather unique ‘symphonic death metal’ sound. The classical elements have remained strong, with the compositions becoming more complex and epic as the years have passed, no doubt a result of co-founder Christos Antoniou’s work with various accomplished composers and orchestras when not playing in the band. Something a little newer here. Greece never exported a huge number of thrash bands even in the movement’s glory days, but this Athens-based four-piece have been making a name for themselves since the early 00s playing that very music. Rising to prominence during the heyday of the thrash revival, Suicidal Angels stood apart from most of their contemporaries by ignoring the ‘fun’ side of thrash and instead drawing upon the darker side of things, and they continue to evoke the likes of Slayer and Kreator with their aggressive aural assaults. Formed in the mid-90s when its main protagonist Alexandros was still too young to legally drink, Macabre Omen issued a number of splits and demos, eventually releasing an epic full-length album in 2005. The follow-up album, Gods Of War – At War, would not appear until a full decade later, but the wait was worth it and the band’s combination of classic Greek black metal elements with a Scandinavian overtone (drawn most specifically from Bathory’s Viking period) has received praise from both fans and critics. Sometimes written off as yet another slick European power metal band, Firewind have actually created some decidedly punchy old school heavy/classic metal works in their time and certainly know how to craft a catchy riff. Mainman Gus G also deserves a bit of a mention in his own right, being not only a solo artist and Ozzy Osbourne’s current guitarist but also contributing to a myriad of bands from Dream Evil and Rotting Christ to Sigh and Old Man’s Child. With a mythologically-coloured brand of Pagan black metal, Kawir are another band from the old days of the country’s black metal scene. Their sound is certainly recognisably Greek, not only due to a use of characteristic synths and ‘warm atmosphere’, but because the band has always incorporated traditional ingredients from their homeland, including acoustic wind and string instruments. The newest band on this list, Sacral Rage formed in 2011 and only released their debut album, Illusions In Infinite Void, last year. Already they have proved themselves to be something special however, thanks to a sound (which, incidentally, they describe as ‘hi-tech metal’) that combines technical speed metal and heavy metal with progressive and left-field moments and a suitably sci-fi aesthetic. Okay, so we’re cheating here, but it’s tough to decide between these two long-running underground metal acts. Both bands play a pretty epic, heavy metal-inspired take on the black metal template and have featured the work of brothers Archon Vorskaath (main band: Zemial) and Eskarth The Dark One (main band: Agatus). Those names, by the way, were not given to them by their parents. Both bands are happily active once more and Agatus are in fact set to issue their first album in almost a decade and half, released in just two weeks time.